The right wing relies on extremist murderers like Las Vegas shooters Jerad and Amanda Miller! At least, that’s what Michael Eric Dyson told his audience when he filled in for Ed Schultz on Tuesday evening’s The Ed Show. Dyson spent the first sixteen minutes of the show blasting conservatives and the Tea Party for their evil rhetoric that he claimed "cultivated the very environment in which the Millers’ sentiment was spawned." After playing a clip of Ted Cruz on the Senate floor, Dyson argued that “some right wing conservatives just don't hear extremists like the Millers, they rely on them as well." He asked his audience if conservatives "feel regret" about these outrageous shootings. 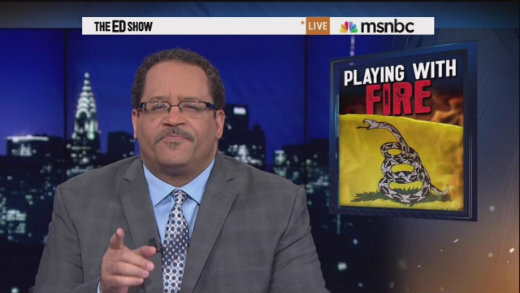 Dyson’s remarks are simply a continuation of the predictable and despicable behavior of MSNBC. The incessant need of the network to lay the blood of dead Americans in the hands of conservatives is downright wrong and offers no substantive input on the current political landscape in America. Someone should ask Dyson if he regrets his irresponsible comments. MICHAEL ERIC DYSON: My friends, Boehner cannot push this off on illness alone. These individuals acted on fostered radical, anti-government beliefs. The federal government was their enemy, and Jerad and Amanda Miller were at war. And they're not alone. Conservatives should rush to condemn these individuals. But they won't, because they've cultivated the very environment in which the Millers' sentiment was spawned. The suspects likened the United States government to Nazi Germany. I wonder where they got that idea. TED CRUZ: You look to the 1940s, Nazi Germany. Look, at what we saw in Britain. Neville Chamberlain, who told the British people, accept the Nazis. Yes, they'll dominate the continent of Europe. But that's not our problem. Let's appease them. Why, because it can't be done. We can't possibly stand against them. So we get to ObamaCare. And what do all of those voices say. Can't be stopped. Can't be done. Cannot de-fund it. DYSON: My friends, this kind of rhetoric has no place in American politics. The idea that anything President Obama has done compares to Naziism or Fascism is offensive. But a group of Americans believe this to be true. The fact that some Americans are desensitized to the frequency of these comments is utterly dangerous. Neighbors of Amanda and Jerad Miller were familiar with their violent tone, but didn't believe their threats. Now they wish they would have done something, told someone. Some right wing conservatives just don't hear extremists like the Millers, they rely on them as well. Do they feel regret?